The first State Regent of West Virginia, Mrs. Eva Hart Goff, of Clarksburg, was appointed in 1893, and she resigned in March 1895, shortly before her death. She is pictured to the left. The next appointment was that of Mrs. Virginia Whiting Faulkner, Martinsburg, who was confirmed on June 6, 1895. She was again reappointed in 1896-97. Mrs. Faulkner is pictured below sitting at her desk. No organization work or appointments were made until 1901. 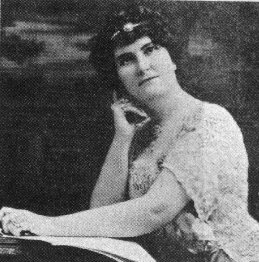 Miss Vallie Virginia Henshaw was appointed the third State Regent. On April 5, 1899, the William Henshaw Chapter was organized in Hedgesville, West Virginia, under the leadership of Miss Vallie Virginia Henshaw. This was a family chapter of fourteen members, ten of whom were great grandchildren of Lieutenant William Henshaw. Lieutenant Henshaw rendered military service in the French and Indian Wars and served during the Revolutionary War. 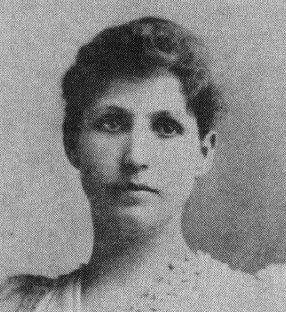 It was the privilege of Miss Henshaw to carry the first State report to Continental Congress in 1902. The following chapters were organized by Miss Henshaw: Colonel Charles Lewis, Point Pleasant; Elizabeth Zane, Buckhannon; James Wood, Parkersburg; and Elizabeth Ludington Hagans, Morgantown. The organization of these chapters in widely separated sections of the State planted the seed for the splendid harvest of succeeding administrations. Through the ninety-nine years, there have been thirty-three State Regents to follow in these first ladies' footsteps. The Society has grown from that one chapter to forty-four chapters in 1999. On October 27, 1990, the West Virginia State Society became incorporated which was another large step in our long distinguished history. The West Virginia Room located in the Memorial Continental Hall Building was finished as a committee room in 1911 and was later changed to a small sitting room. The room was completely redecorated in 1949-50, when it was established as a period room. It was again redecorated in the late 1980s and continues as a period room. In 1993 the West Virginia State Society adopted the former Ohio Society cottage at Tamassee DAR School. Since that time there has been extensive remodeling of the in order for the school to use it as a guest cottage. It was named for Josephine Clark Peters, member of a Charleston Chapter. The State Society continues to promote the objectives of the National Society: Historic Preservation, Promotion of Education, and Patriot Endeavor.